Aliens in the Attic is a 3D platform-hopping adventure based on the movie of the same title, starring Skip, Tazer, Razor, and Sparks. Released alongside the 20th Century Fox summer 2009 theatrical feature, the video game tells the same story as the film, but from the perspective of the aliens. Guiding the four otherworldly characters, each with different abilities, players use jumping skills and extraterrestrial equipment to make their way through oversized game stages set within an old house. 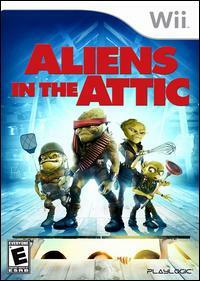 Aliens in the Attic plays out in the Pearson family's country summer home in Maine, but in the roles of the aliens, players will see each new area as strange and dangerous foreign territory. The game plays out from the open rooftop, to the attic, living room, and garden, with the home's ventilation system serving as passage from some areas to others. The alien's most powerful weapon, their mind-control device, works on adult humans but does not work on children, so the aliens will need to use their wits, and solve in-game jumping puzzles, in order to complete missions, reach important areas in the old house, and wrest control of it from its young inhabitants.